Microphones detect the imperceptible movement of air caused by passing sound waves, but the mic is unable to distinguish between this ideal situation and one where the air is still and the mic is wobbling back and forth on its stand! This all‑too‑common situation is caused by mechanical vibrations — foot falls, kick drum thumps, or whatever — reaching the mic via the stand, and the result is often surprisingly high levels of subsonic frequencies, typically in the 5‑20 Hz range, which can overload mic preamps, cause intermodulation distortions, steal the headroom margin, overheat power amplifiers, and even shred loudspeaker cones — and that, of course, is why the 'shockmount' was designed. A ribbon diaphragm's resonance is usually below 20Hz and a ribbon mic is normally a pressure‑gradient device. Both these facts make ribbon mics extremely sensitive to low-frequency mechanical vibrations. 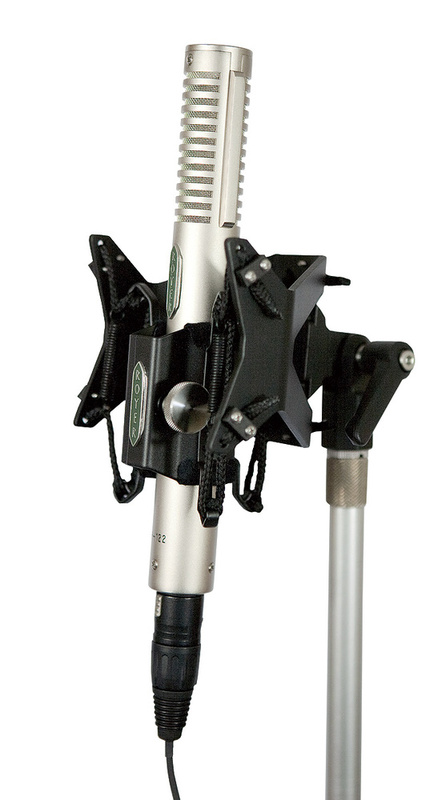 Royer Labs make ribbon mics, and have designed their own solution to this problem: the new RSM‑SS1 'sling‑shock', which is a clever (patent pending) shockmount optimised to the specific requirements of their own mics. Royer's ribbon mics have relatively small body diameters of around 25mm, but as they're 'side‑address' mics the normal pencil‑mic shockmounts are inappropriate, because their maximum isolation acts in the wrong plane. Most shockmounts intended for side‑address mics are large and cumbersome, which may be perfect for larger mics, but not ideally suited to the slender Royers. The RSM SS1 is designed to provide excellent isolation in the correct plane, with a relatively compact and maintenance‑free cradle. An outer frame fixes to the mic stand (a 3/8‑5/8 thread adaptor is included), and suspends an isolated inner cradle that supports the mic in a felt‑lined tube, clamped shut with a large knurled screw. Installing and removing the mic is quick and easy, and can be done either with the shockmount attached to the stand or separately. The critical part of any shockmount is the way the inner cradle is supported from the outer frame, and Royer's design involves a clever six‑point suspension with non‑resonant nylon cords, tensioned by three damped springs. Suspension links on the front left and right sides provide lateral support, while a third link at the rear allows a greater degree of movement in the fore‑aft plane, perpendicular to the diaphragm — where it needs to be to provide the optimum isolation. One major benefit of this design is that it should remain stable and maintenance‑free, because the nylon cords won't stretch and the springs won't lose their tension — unlike so many elasticated‑cord cradle designs. However, the support cord tensions can be easily adjusted, if necessary, by loosening screw‑down clamps on the outer frame and pulling through more or less cord.